There are so many places to use wall stickers! Use wall stickers on walls, of course, but you can also use wall stickers on doors, windows, mirrors, tiles, the ceiling, the fridge, cupboards, the loo! You can use wall stickers on just about any nice clean and smooth flat surface at home or at work that they’ll stick to. Use wall stickers on a matt surface rather than on a glossy surface. Use wall stickers as home wall decor of course! Use wall stickers in the bedroom – guest bedrooms, adults bedrooms, teenagers bedrooms, toddlers bedrooms and as baby nursery decor. Use wall stickers in the kitchen, dining room, lounge, bathroom, home office, playroom, and in entrance halls and passages. Decorate laundry room walls, entertainment area glass doors or windows or walls, patio walls, deck walls, and internal carport or garage walls. Then think about each of those rooms and other items in those rooms that you use wall stickers on, or even walk into each room with pen and paper, and take notes. Note down all the flat and smooth surfaces in each room on which you could use wall stickers, even small wall stickers. 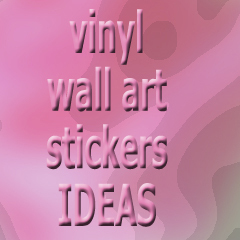 Use wall stickers to decorate smooth flat surfaces at your flea market or craft market stand. One can also use wall stickers temporarily as part of theme decoration for kids parties, baby showers, wedding receptions and for any party or celebration that has a particular theme – use themed wall stickers – and after consulting with the party or reception venue owner. If the venue owner is worried about who is going to remove the wall stickers and how soon after the party or reception the wall stickers will be removed, consider applying the wall stickers to large sheets of glass or wood (or something else that wall stickers will adhere to) that you take to the venue instead. For parties and receptions also consider using small wall stickers on table decorations and other decorations – as long as those decor items have a smooth flat surface that isn’t glossy. Use wall stickers all over!